MNP makes it possible for customers to retain the number used with their current operator (Donor Operator) after concluding a contract with a new operator (Recipient Operator). Currently, customers changing mobile phone operators must cancel their existing contract at one shop and conclude the new contract at a different shop. 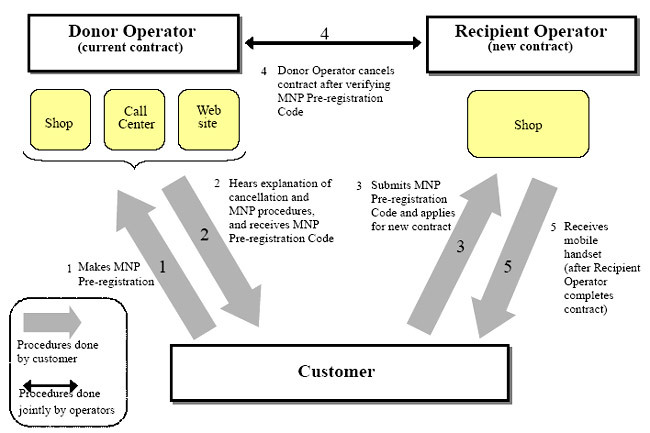 MNP will make it possible both to cancel the Donor Operator contract and conclude the Recipient Operator contract with one visit to a Recipient Operator shop, providing they complete an MNP Pre-registration Application with the Donor Operator, either by phone or Internet (or at a Donor Operator shop, if preferred). The procedures at the Recipient Operator shop are expected to take no more than a few hours. 1. Customer submits MNP Pre-registration Application to Donor Operator. 2. Donor Operator explains cancellation and MNP procedures, then issues MNP Pre-registration Code. 3. Customer takes Code to Recipient Operator shop and applies for new contract. 4. Donor Operator cancels contract after verifying Code sent by Recipient Operator. 5. Recipient Operator processes application and customer receives new handset. - The e-mail address issued by the Donor Operator cannot continue to be used. - Services offered by the Donor Operator (billing plans, discount services, etc.) can no longer be used once the contract is cancelled. - In some cases, customers? unused e-money and services of certain content providers may no longer be usable. - Customers subscribing to yearly discounts and other discount services may incur separate charges in line with cancellations. - Switching operators requires use of a Recipient Operator mobile handset.